In our Rook there is no unnecessary foot movement in any direction thanks to the combination of our BOA® Closure System and internal Lock Down™ Turbo lacing. This budget-friendly boot is designed with performance and comfort in mind. Boasting a medium flex this boot is the perfect fit for an entry-intermediate level freestyle rider. Forget the pain of having to tie your boots before each session, the Rook uses the BOA system, to add some ease to your day. You'll benefit from added ankle support and heel hold, with the internal J bars, for superb performance and durability wherever you take them. If you're looking for a boot to help you step-up your riding, then look no further than the 2019 Ride Rook. The shell-integrated Intuition™ Plush Foam Liner ensures all-day comfort, while the Thermo-Formable Internal J-bars keep heel hold in check and provide additional ankle support. 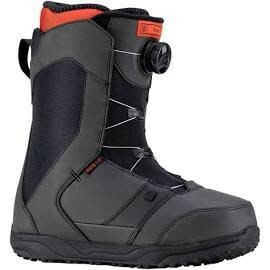 You don’t have to be a grandmaster of snowboarding to get maximum performance out of the Rook and with this combination of features you can be confident your foot will be comfortable for a day of riding, regardless of your ability level.